Visit one of the world’s most powerful museum experiences, the National Museum of the Mighty Eighth Air Force. Located only minutes from historic downtown Savannah, where the Eighth Air Force was activated in 1942, the 90,000-square-foot museum is dedicated to preserving the history and stories of the Eighth Air Force, the “greatest air armada of all time.” Hear the unforgettable stories of bravery, experience a bomber mission and briefing, and see the ongoing restoration of the World War II B-17 Flying Fortress “City of Savannah” inside the Museum’s Combat Gallery. 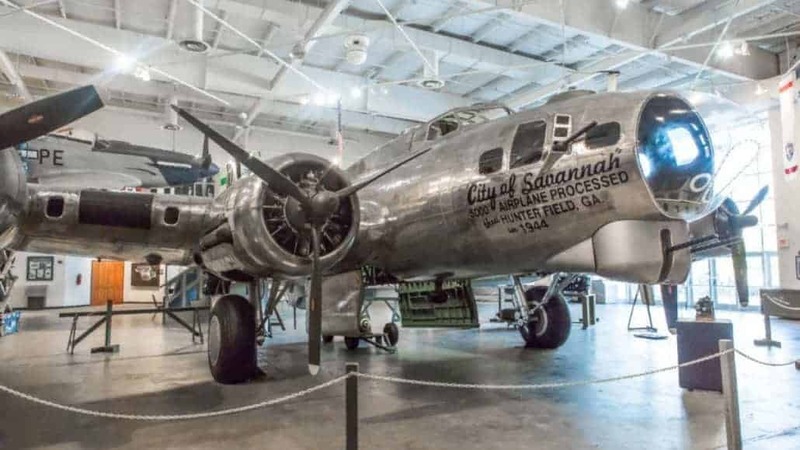 The National Museum of the Mighty Eighth Air Force is an experience not to be missed while visiting Savannah! We are pleased to be able to offer group tours of the National Museum of the Mighty Eighth Air Force. These tours can be self-guided or guided by our incredible Museum Docents. If you choose for your group to tour self-guided (on your own), you will want to plan on a minimum of two hours. Guided tours are two hours in length. If you have limited time, just let us know and we will tailor a shorter tour for your needs. The National Museum of the Mighty Eighth Air Force is home to a traditional English Pub. You can enjoy lunch there, Monday thru Friday from 11 am to 2 pm, with food prepared by our in-house restaurant, Miss Sophie’s Marketplace.